Parent Education Workshop Series: Parenting is full of joys and challenges at every age and stage. 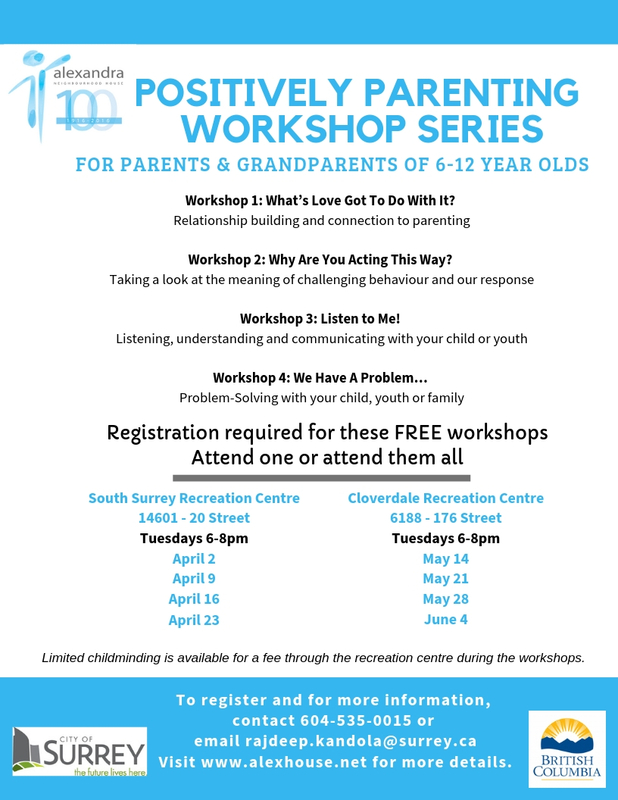 The Positively Parenting Workshop Series has four interactive workshops designed to empower, connect and support parents of children and youth ages 6-12. Topical information, resources, meaningful activities and role-plays are provided to practice and facilitate discussion. Workshops also give parents the opportunity to connect, share with and support one another. Each workshop can stand-alone, so parents can choose to attend just one workshop or all, depending on needs and interests. These free, popular workshops are a great way to meet other parents, share ideas, and gain new perspectives. Limited childminding for ages 12 and under available through the recreation centre, for a fee, during workshops. POSITIVELY PARENTING Workshops are offered in two locations. Program runs 6-8pm in both locations. If you have any questions please call 604-535-0015 or email scranstone.anh@gmail.com.